Silently Harmed in the U.S.
Last week’s blog, “A Bystander – No More!” has set the table for this week’s blog. I have recently founded another organization with the vision to advance the transparency of facts through objective research and innovative solutions in the delivery and payment of health care. Our mission is to provide meaningful health care information to improve decision-making for consumers, employers, health care providers, policymakers and the general public. The name of our new organization is Heartland Health Research Institute (HHRI). HHRI is a collaboration between Dr. Yogesh Shah and me. Dr. Shah serves as associate dean for Global Health at Des Moines University (DMU) – a position created to establish and increase international rotation opportunities, medical service sites and other global health experiences sought by DMU students. 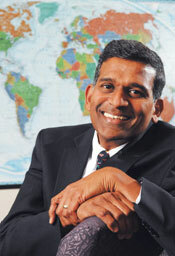 His passion includes improving the health of people around the world. Dr. Shah is triple-board-certified in family medicine, geriatrics and hospice and palliative care. He is very involved through the World Health Organization (WHO) and was instrumental in making Des Moines a member of the WHO network of age-friendly cities. Dr. Shah led the creation of the Heartland Global Health Consortium, a collaboration of Iowa educational learning opportunities for students. He was awarded a Fulbright scholarship to develop a palliative care program in Rwanda. 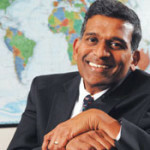 Dr. Shah was born in Mumbai, India. Dr. Shah and I met a year ago while jointly working on a research project for Capital Crossroads. Through this interaction, we realized our passions about health care were very similar, and our seemingly disparate backgrounds are actually complimentary to one another. It was through our discussions that HHRI was conceived. So what will HHRI do? An ongoing need exists for objective, unbiased information regarding the local health care system, so that decisions affecting our system will be based on verifiable facts. HHRI was founded to conduct research and provide education focusing on a broad spectrum of health care issues. Topics covered are specifically from the patient’s perspective and measure patient confidence and trust in the health care system today and into the future. 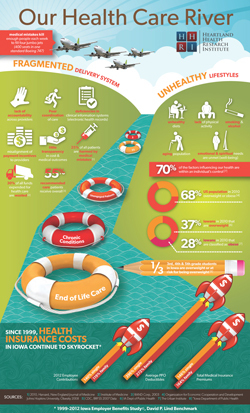 Data to reveal major health challenges and opportunities. Credible, reliable and objective research for decision-makers, policymakers, employers, media and the general public. Exploring and presenting key health care issues with thought leaders from all sectors. We want to provide understandable information that can be used to solve the problems our health care system suffers from today. Our work must provide clear results that will be applied to everyday decision-making by employers, employees, policymakers, media and the general public. Having a healthy, robust workforce and population is critical to the economy of Iowa and other Midwestern states. In the future, I will continue to monitor the downstream of Our Health Care River using the annual Iowa Employer Benefits Study. 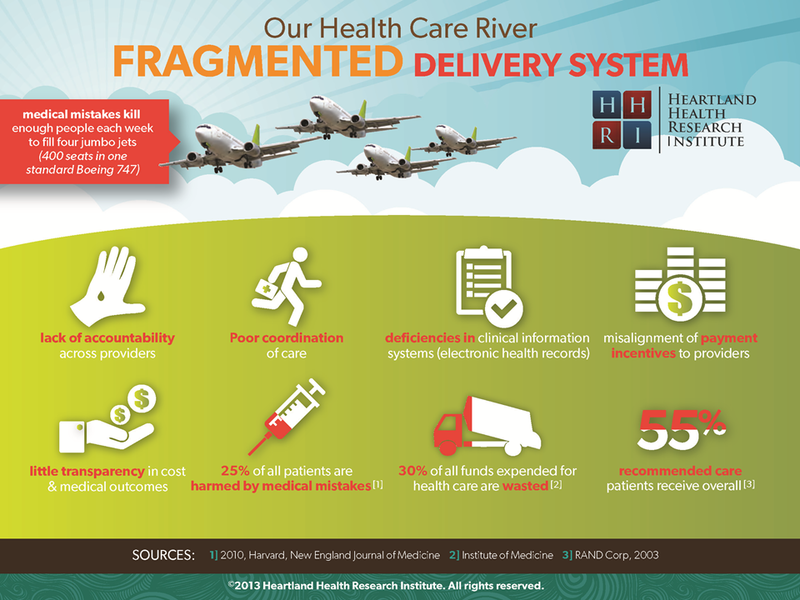 With the advent of HHRI, we will now be able to move upstream and pursue critical issues inherent within our health care world. HHRI is new and fresh and created to make a real difference. You will be learning much more about our work in the months ahead! Should you have further questions about HHRI, I encourage you to contact Dr. Shah or me. Similar to a bystander observing something that makes them feel uneasy, such as a mugging or a car wreck, a familiar ‘spectator-feeling’ applies when watching the evolution of our health care issues – at least for me. It began in 1984, when I worked as an account consultant at Blue Cross and Blue Shield of Iowa (Wellmark), and I consulted with Iowa employers on the health benefits they provided to their employees. For those of us old enough to remember, health insurance premium increases were exorbitant in the eighties. In fact, they were even greater than what we have observed in the twenty-first century. Premium inflation in the eighties could certainly be considered a major car wreck or a mugging over which insureds had no control – and I was both a spectator and a participant tangentially tied to the carnage. In the early-to mid-nineties, hospital expenses and revenue increased very slowly while insurance premium inflation tapered off. However, later that decade, premiums began to move upward again. As in the eighties, my observations allowed me to conclude that rising health care costs and insurance premiums were just too pervasive to successfully solve. We were all innocent bystanders standing with mouths agape, right? In that year, we began our first annual “Iowa Employer Benefits Study,” which is now in its 15th year. 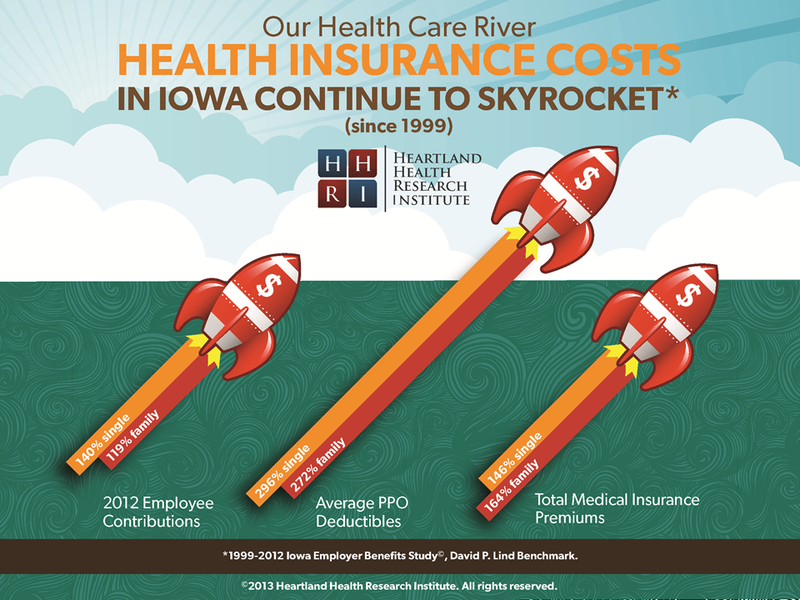 Over the years, we have been monitoring the benefits offered by Iowa employers – with health insurance being the most salient of all benefits due to sheer runaway costs and social issues. I was now becoming very intrigued (if not obsessed) with the societal issues of health care and how it impacted health insurance premiums within Iowa and beyond. In short, understanding how health care could be delivered more safely and efficiently would, ultimately, favorably impact the direction of health insurance premiums paid by employers and their employees. Unfortunately, it was just too easy and convenient for me to remain an ‘innocent’ bystander observing the smoldering wreck that is our health care system AND reporting the results in our annual Study. Again, I unconsciously watched the buildup of these wrecks, somehow rationalizing that others who were more knowledgable and capable could ‘fix’ the underlying reasons for the undeniable malfunctions. The health care problem is just too vast to tackle – right? Repetition drives habits, and habits can be extremely powerful over a period of years. My ‘habit’ was to witness this wreck of a health care system, shake my head in disgust and do little or nothing to try to assist others with possible solutions to fix the underlying cause of the problem. As time went on, a nagging question became more of a roar: “With the inability of our health care ‘system’ to deliver safe and efficient care to our population, should I continue as a bystander and perpetuate this troubling activity or try to do something to help remedy the situation?” I needed to decide how I would focus my efforts in the future. Finally, in October 2011, I made my choice. I would no longer continue in the role as an employee benefits consultant. Instead, I would follow my passion to help others seek new and clear initiatives to pursue the core problems within our truly dysfunctional health care system. 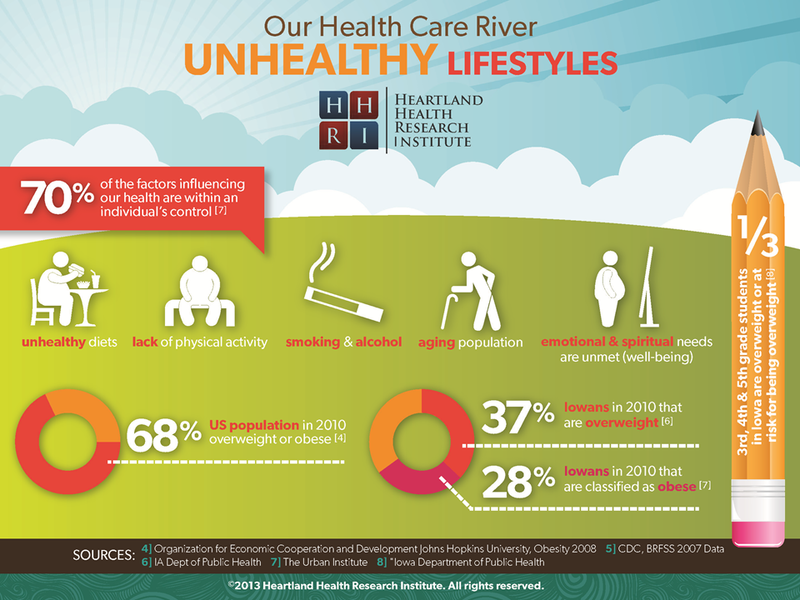 You may have noticed the “Heartland Health Research Institute” (HHRI) logo within the infographics. HHRI is our new company that will begin to address some of these root causes upstream. More about HHRI’s mission and vision in next week’s blog. My goal is to put our wreck of a health care system in the rearview mirror and concentrate my efforts on being a part of the solution…because we have to start somewhere. Autonomist: The independence to share one's thoughts and to have the freedom from external control or influence. Subscribe to The Health Autonomist!